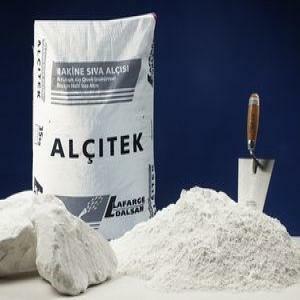 ALÇITEK is bagged gypsum-based, ready-to use spray plaster. ALÇITEK can be directly applied on brick, concrete, aerated-concrete, etc. In one layer, it prepares the surface ready to pain. There is no need for satin finishing gloss plaster. It can be applied at details such as window and door fronts with hand mix, without any problem. It has a high surface hardness and brilliant appearance. Dust and substances preventing adherence on the surface must be cleaned before the application. Make segmentation on the surface by using segment laths. Mix ALÇITEK by a plastering machine and spray it between segments. After spraying, smooth the surfaces by using a straight edge. In about half an hour time before the surface hardened, smooth the surfaces again by using a straight edge if required. Make pre-smoothening with spatula. Wet the surface and apply sponge. Approximately 10 minutes later, using a steel trowel get a brilliant, hard and glazed surface. Never mix ALÇITEK with any other product or material. Thickness of application should be between 8-30 mm. Do not use ALÇITEK in temperatures below +50C. Dry and hot surfaces should be definitely dampened before the application. 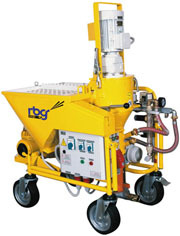 Plastering machine and the application tools should be cleaned. Bags should be store in dry places and should not be stacked in more than 15 layers. Direct contract with ground and moisture must be avoided. Using ALÇITEK within 3 months after the date of production is recommended. Poor or over-long storage may deteriorate the physical properties of ALÇITEK.